Put beef stews in pressure cooker, add 2 cups water and turn the heat on to medium. Let it cook for 25-30 minutes. Turn the heat off and drain the meat, set that aside. Peel the potatoes and onion, slice them round like ring, fry them in 2 cups oil. Put 4 tbsp butter in a pan, having two handles (because after cook maklube you will turn it up side down so you will need handles to hold and turn it easily). Place fried ring onion and potatoes as one layer at the bottom of cooking pan. 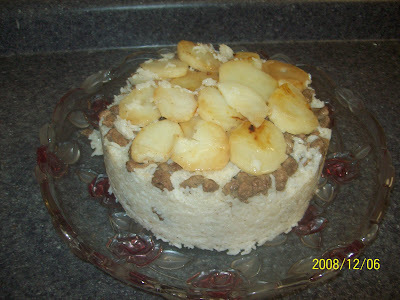 Add already washed and drained 2 cup of rice, place cooked half of beef stew ,as a layer, on top of rice. Then repeat the process first fried potatoes, then uncooked last cup of rice, finally beef stews on top of rice. When you finish, put salt and pepper in beef stock and mix well. Pour the stock gradually over finished but not cooked dish. Add more water in and be sure you add enough wter for rice. Apprx. 4,5 cups of water is enough for 3 cups of regular rice. After you make sure rice is soft and cooked, turn the heat off and let it cool down a little bit. Turn the pan on a round tray, decorate around maklube with salad and yogurt.